Naturally I took the numbers from the eCalc simulations with a grain of salt, however they indicated that I was in the right ballpark; roughly 7kg of thrust with a total weight of about 2.6-2.7kg, hovering stationary in no wind for 27 minutes. 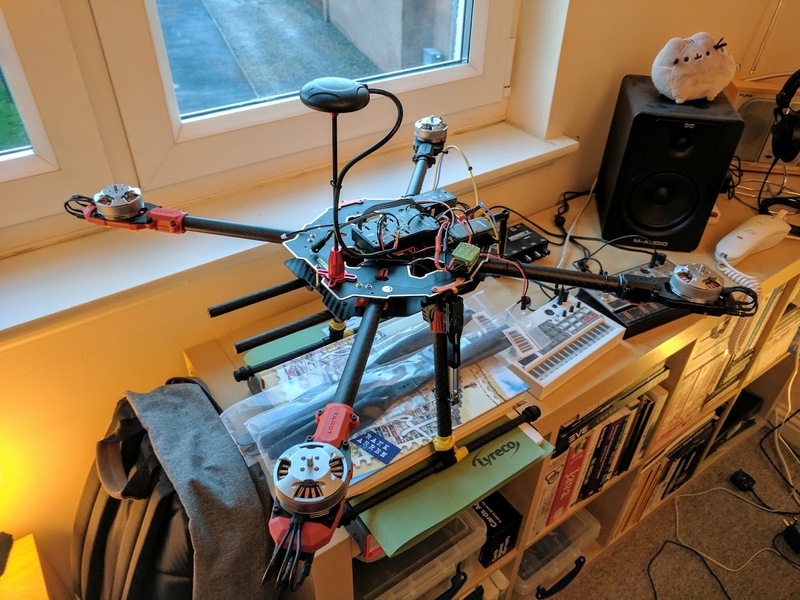 In the end I couldn’t find any 15×5.5 props with the correct hub design & realised that the motors would actually be slightly over their rated power at 100% throttle, so I opted for 14×5.5 instead which kept the motors happy even at 100%. 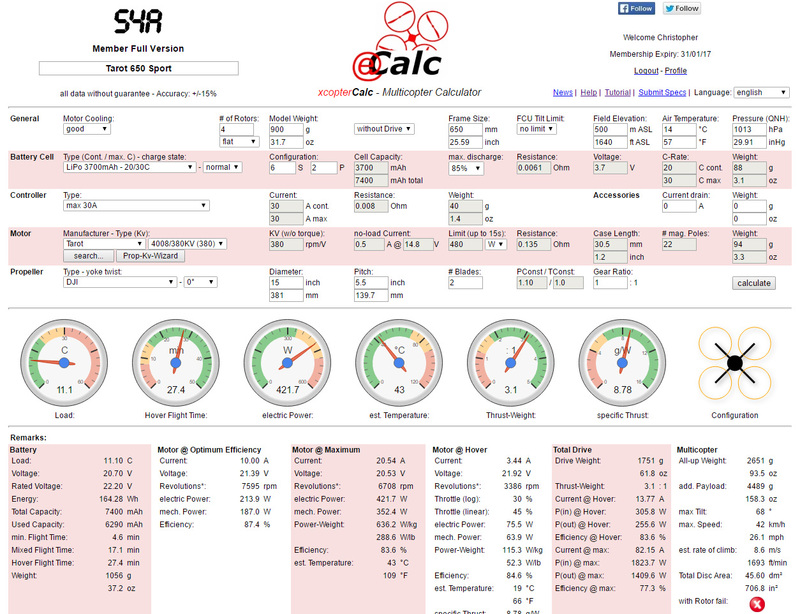 I didn’t save a screenshot from eCalc with the 14″ props, but it didn’t make a huge difference. 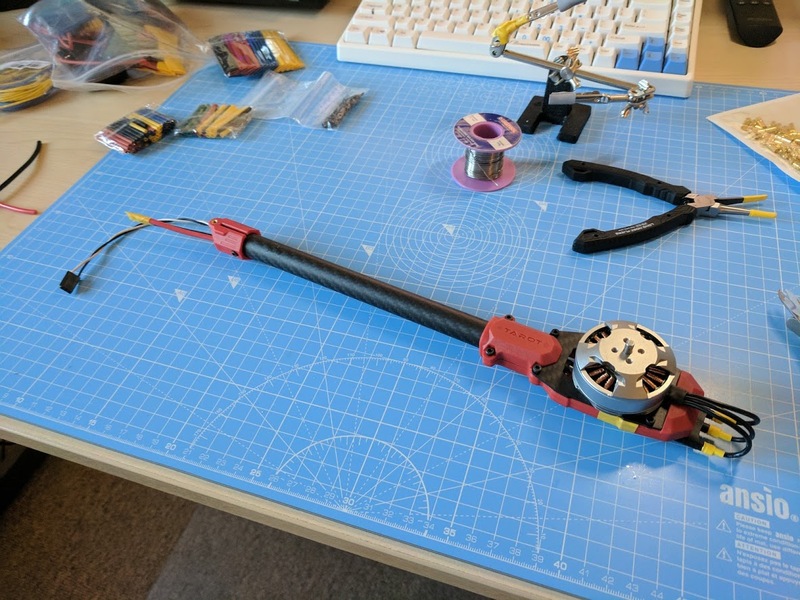 I started off by inspecting the Pixhawk that I bought from Unmanned Tech. It seemed to be a decent sample, with all of the surface mount kit straight/neatly soldered & with a piece of foam over the barometer. I checked the version of the STM32F4 & it didn’t have the 1MB limit of the earlier revisions. 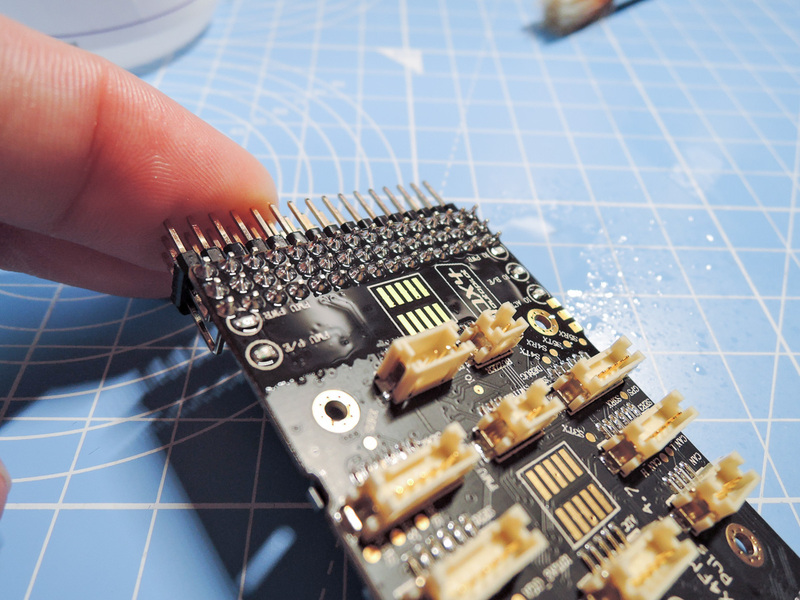 The only thing I didn’t like was the amount of flux left over on the pin header connections, so I washed that end of the board with isopropanol. 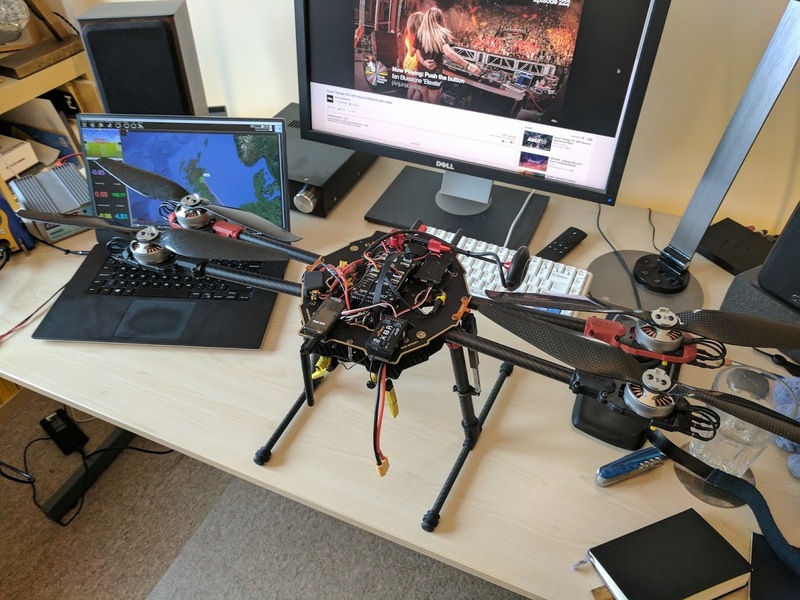 Unfortunately the physical size of the ESCs meant that there wasn’t really an alternative to having the motor wires pointing outward. 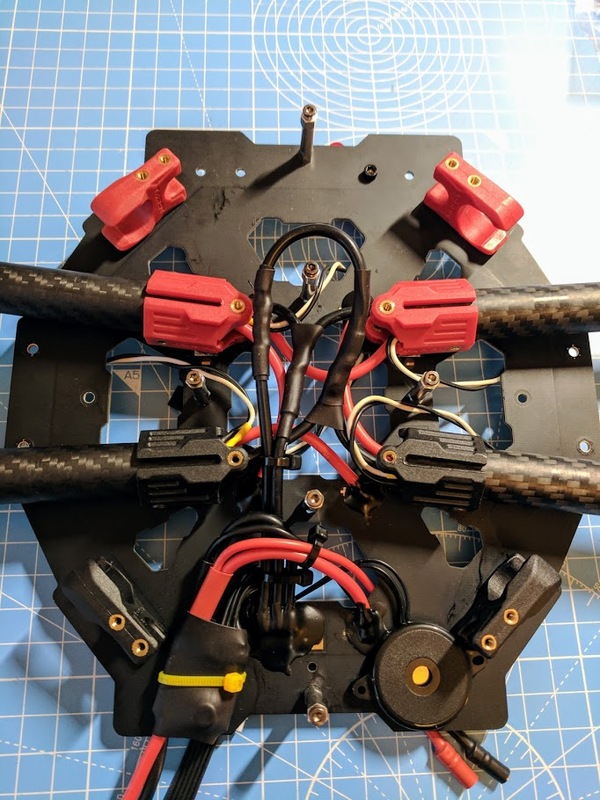 I could have used smaller/lower power ESCs, as the motors will only pull about 15A at 100% throttle, however several people told me that these Hobbywing XRotor units worked much more reliably with the low kv & high stator count of my motors. 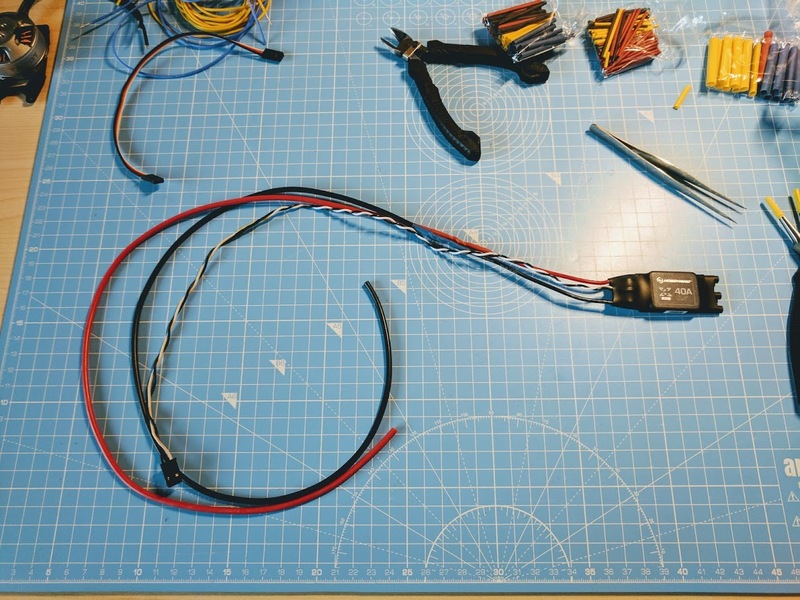 I didn’t want to tear the ESCs apart to try to desolder the sockets so that I could direct solder the motor wires, so I just added connectors to the motors wires (I replaced the yellow heatshrink with black at a later stage & the tape was replaced with zipties). Next I came to the PDB & the biggest source of grief throughout the entire build. One of the big selling points of the frame for me was its folding design; the arms fold inwards to produce a long thin package that you can fit into a rifle/shotgun hard case. 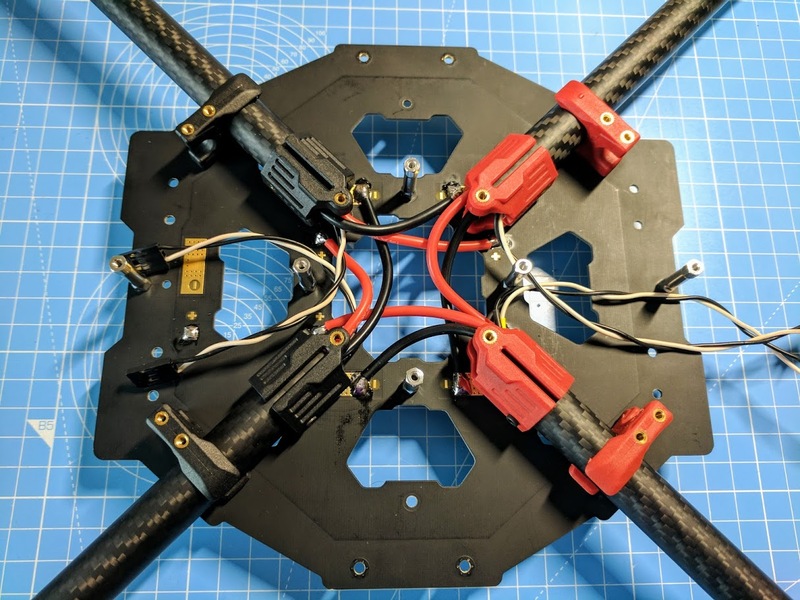 The frame also comes with a PDB built into the top plate, with a pair of pads at the back for your battery input & pairs of pads next to each arm for your ESCs. However as one RC Groups member so aptly put it, this PDB is nothing but a cruel joke. 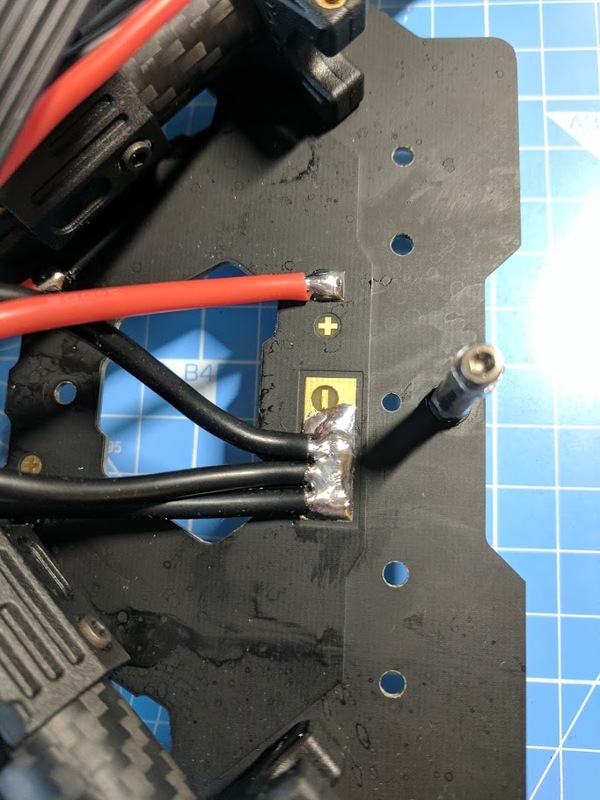 The ESC negative pads are so close to the arms that even if you solder right on the edge of the pads, you prevent the arms from folding all the way. 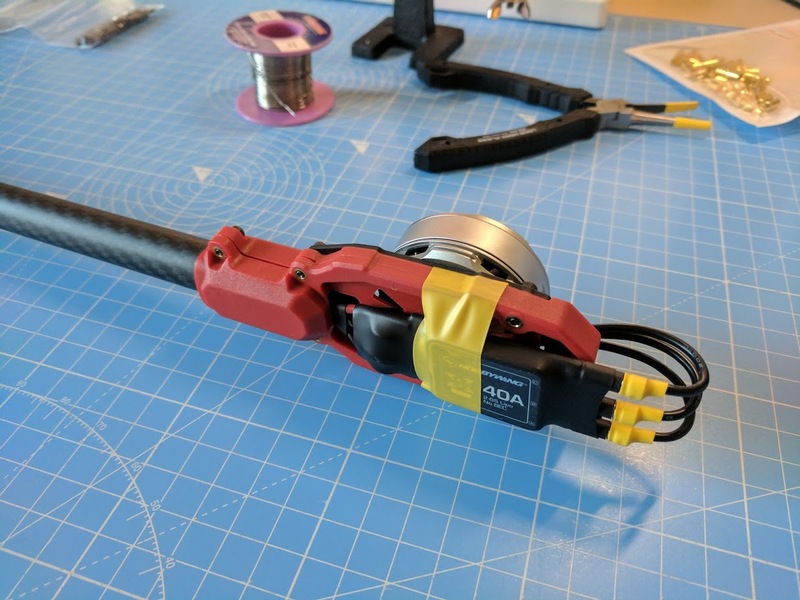 In addition, because the arms are held in their outward position by extremely strong clips, each time you close them you end up jerking them inward as they leave the clips – straight into your solder joints. Here is the PDB soldered up as intended – note the location of the negative pads/joints & imagine the arms folding toward them. 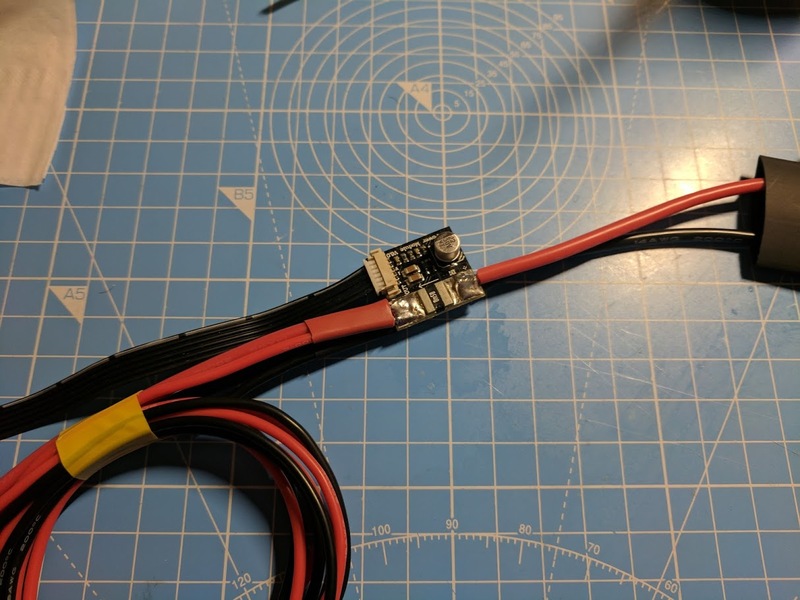 I tried a whole bunch of different approaches, including trying to fit a miniquad PDB somewhere inside the frame (there simply wasn’t room with 5 sets of 14AWG wires coming off it) & using the trim on the upper side of the frame for the negative connections (an idea I found on RC Groups – the inner trim has continuity to the negative rail, but I didn’t trust the thickness of the trace). 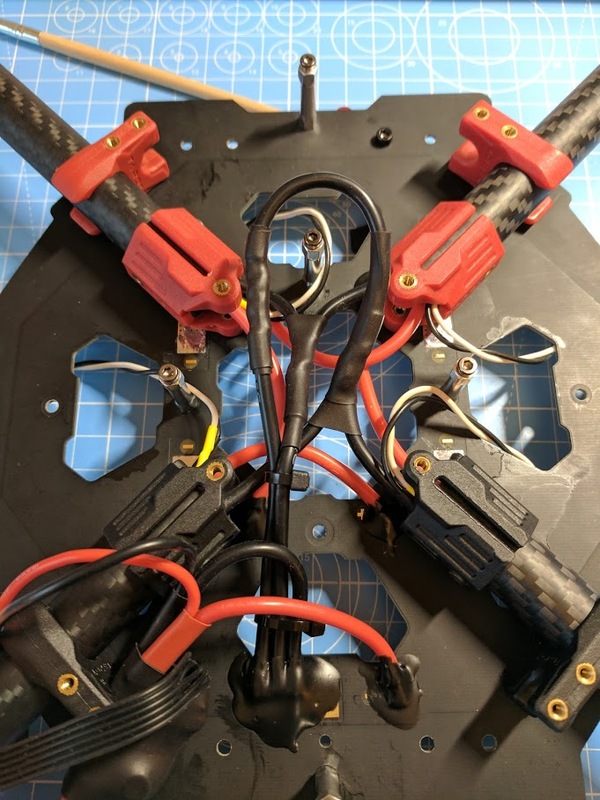 The first of those 3 wires goes to the battery, the second goes to a splice for the front motors & the third goes to a splice for the rear motors. 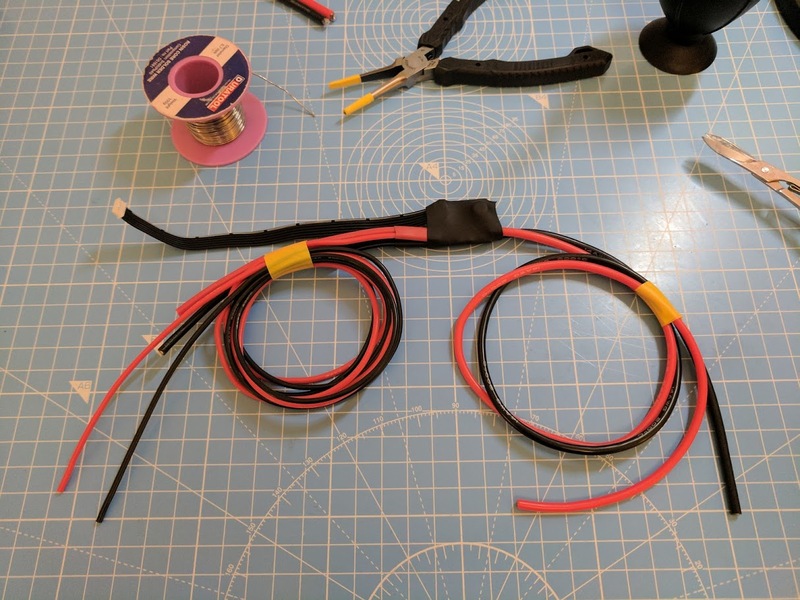 Not the absolute neatest solution (is there a neat way to heatshrink a Y splice? ), but I’m confident in the joins & it allows the arms to fold all the way. 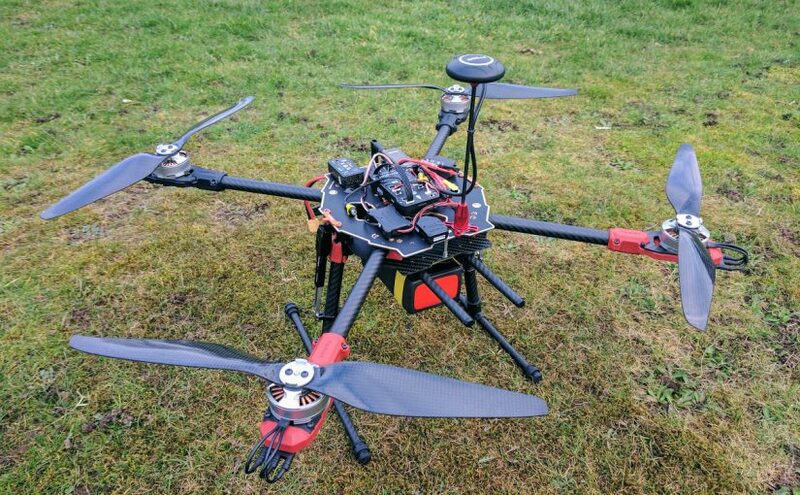 You can also see the Pixhawk power module in some of these photos. I soldered two sets of wires coming off of it, one thicker gauge to power the motors & second thinner gauge to power the 5v & 12v regulators. 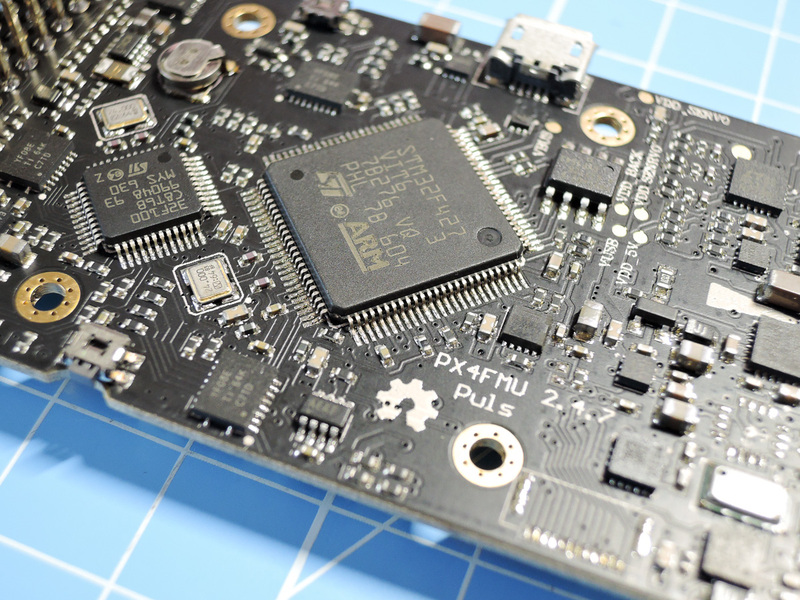 This module supplies regulated power to the Pixhawk, along with voltage & current readings. With the power sorted, it was time to start mounting all of the electronics to the top plate. This is where another of the frame’s shortcomings rears its head; there are essentially no mounting holes so you have no choice but to use foam tape (3M VHB to the rescue). I started by temporarily taping things in place with electrical tape to decide where everything would fit. 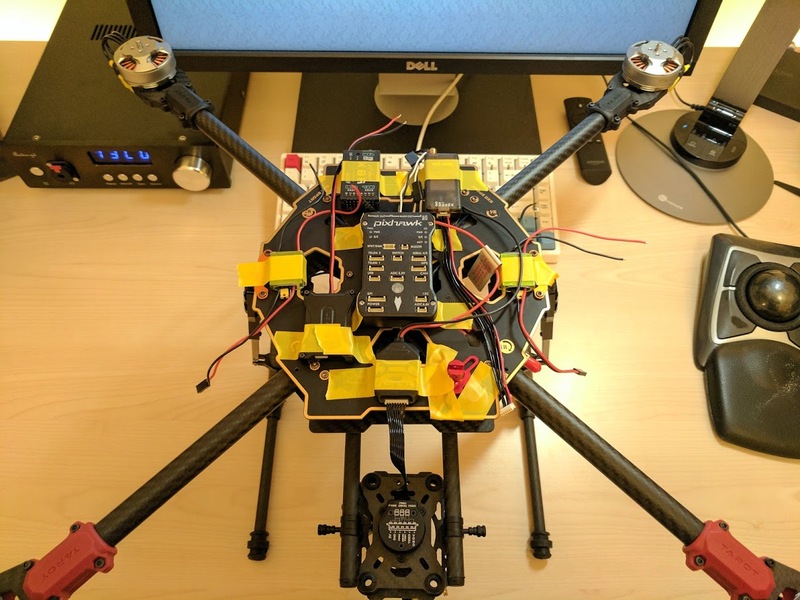 It quickly started to look more like a quadcopter. 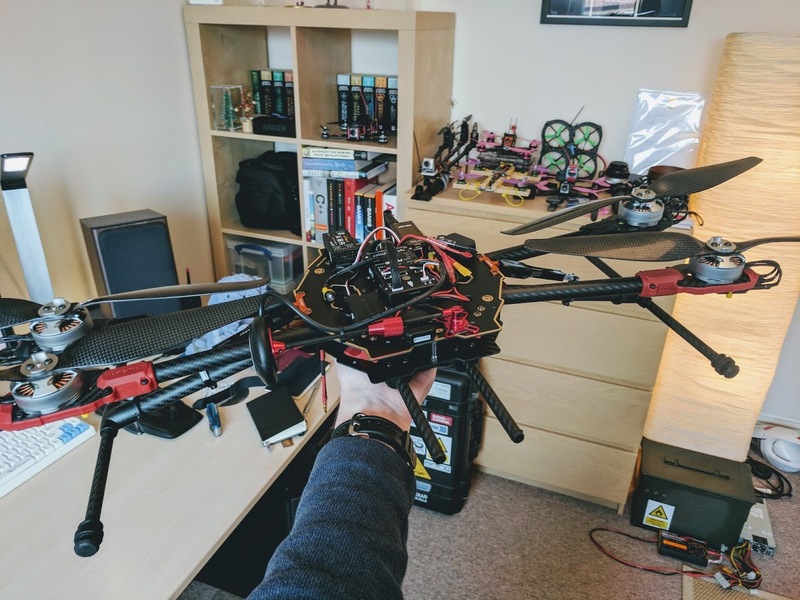 I opted to do a test flight before attaching/wiring up any of the camera gear; better to test the basic flight functionality first, then attach hundreds of pounds worth of camera gear after! Arms & GPS antenna folded for transport. And the motorized landing gear raised. 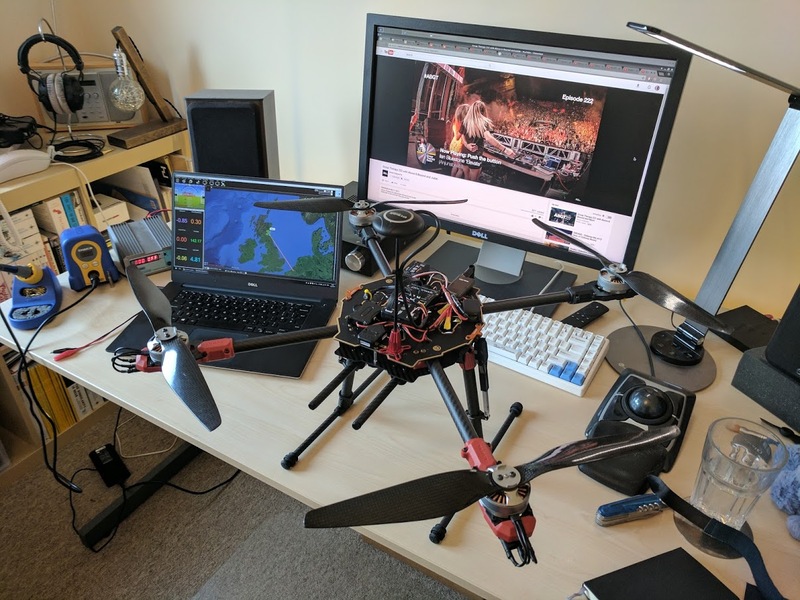 The test flight was a success! Next part will cover the camera gear.